1Department of Plant Science, Federal University of Viçosa/UFV, Av. Peter Henry Rolfs s/n, Campus Universitário, 36570-900, Viçosa, MG, Brazil. 2Researcher, National Institute of Science and Technology in Salinity - INCTSal. Department of Plant Science, Federal University of Paraiba/CCA/UFPB, Areia, PB, Brazil. 3 Soil and Water Management, Federal University of Paraíba/CCA/UFPB, Areia, PB, Brazil. 4Department of Soil and Rural Engineering, Federal University of Paraíba/CCA/UFPB, Areia, PB, Brazil. 5Department of Agropecuária, Federal University of Paraíba/CCHSA/UFPB, Bananeiras, PB, Brazil. Noni (Morinda citrifolia L.) is a fruit species of the Rubiaceae family that fructifies all year round during its productive stage in its whole productive branch (Cavalcante et al., 2014; Kumar and Ponnuswami, 2014). This species was domesticated and cultivated by the Polynesians in several regions of Tahiti and later, by different Hawaiian tribes; currently it is cultivated in the South Pacific, India, Caribbean and South America, including Brazil (Singh and Rai, 2007; Silva et al., 2014a; Souto et al., 2016). Among the existing noni cultivars, M. citrifolia cv. citrifolia is the most important from a commercial point of view (Assi et al., 2015). The importance of the species is due to its chemical composition, such as its antibacterial, antiviral, antifungal and anti-inflammatory properties, as well as its associations with cancer prevention and increased immune response. These attributes have attracted the interests of specialized industries to process noni fruits for use in the production of drugs, insecticides and natural reagents (Singh and Rai, 2007; Assi et al., 2015). In Brazil, noni was introduced at the beginning of the twenty-first century in São Luís city, located in Maranhão State. Scientific information regarding soil fertility and the nutritional needs of the noni plant is not widely available in the literature in Brazil or worldwide (Teixeira et al., 2016). Due to this lack of information, noni nutritional requirements are estimated using coffee trees (Coffea arabica) as a reference, given that both belong to the same family (Cavalcante et al., 2014; Silva et al., 2014a). Therefore, the establishment of adequate levels of nutrients is necessary to assist fertilization and nutritional requirement for noni cultivation plans (Silva et al., 2014a; Souto et al., 2016). Potassium is one of the most exploited nutrients in noni cultures (Silva et al., 2014a) and is, in quantitative terms, the second most abundant in foliar tissues and the most present in fruits (Cavalcante et al., 2014). The importance of potassium (K) for plant species is due to several metabolic processes that it participates in such as; carbohydrate transport protein and enzyme activation, stomatal opening and closure, and photosynthesis (Marschner, 2012; Wang and Wu, 2013). In addition, this nutrient influences the absorption of other nutrients by plants, contributing to the improvement of the production quality (Moinuddin and Imas, 2010; Ranade-Malvi, 2011; Almeida et al., 2015; Anjos et al., 2015). Noni cultures positively respond to the application of organic matter to the soil in the form of cattle manure, resulting in nutritionally balanced plants and fruits with adequate post-harvest quality (Kumar and Ponnuswami, 2014; Silva et al., 2014a; Souto et al., 2016). Despite the low concentration of nutrients in cattle manure, it holds all those essential to plants, and, after soil application, these are gradually released during the mineralization process, with lower losses compared to mineral fertilization (Higashikawa et al., 2010; Quilty and Cattle, 2011; Shah et al., 2016). Application of manure reduces production costs and provides quality production of fruits, as verified with mineral fertilization (Pacheco et al., 2017). In addition, the application of organic material in the form of bovine manure associated with potassium mineral addition has contributed to the improvement of plant nutrition, with effects on production and quality of fruits (Rodrigues et al., 2009; Silva et al., 2014a; Souto et al., 2016). Considering the lack of information regarding the nutritional requirements of noni and its relation to production components, we aimed to evaluate the foliar mineral composition and production of noni plants fertilized with cattle manure and potassium. The study was carried out from July 2012 to November 2013 at the Center for Human, Social and Agrarian Sciences of the Universidade Federal da Paraíba, Municipality of Bananeiras, Paraíba State, Brazil. The municipality is georeferenced by the coordinates 6°46’ S latitude and 35°38’ W longitude from the Greenwich Meridian, at 552 m of altitude. The rainy season in this region is concentrated between April and August, with a drought from September to December. Throughout the experiment, the accumulated precipitation was 1.242 mm, with the lack of rainfall during October and November of 2012 and maximum precipitation rates in June and July (Figure 1). For temperature and humidity, the average values were 25 °C and 65%, respectively. Figure 1: Mean monthly values of relative humidity (―), air temperature (∙∙∙∙) and pluviosity (- - -) throughout the experiment. The soil of the experimental area was classified as dystrophic yellow latosol (Embrapa, 2013). Prior to the experiments, four soil samples per block were collected from the 0-40-cm layer, totalling 12 samples. After drying in the shade, samples were sieved (2-mm mesh), transformed into composite samples and characterized by their physical and chemical attributes regarding fertility (Table 1), as described in Donagema et al. (2011). 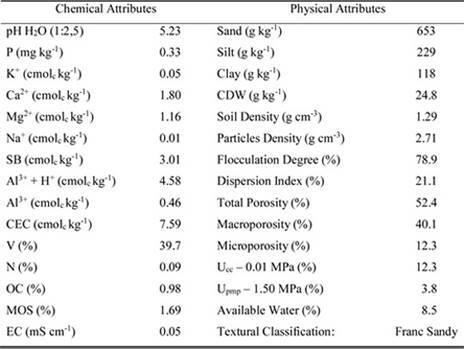 Table 1: Chemical and physical attributes of soil before the experiments in the 0-40-cm layer. CDW = clay dispersed in water; pH = hydrogen ionic potential; P = phosphorus, Mehlich-1; K+ = potassium, Mehlich-1; Na+ = sodium, KCl 1 mol/L; Ca2+ = calcium, KCl 1 mol/L; Mg2+ = magnesium, KCl 1 mol/L; SB = sum of exchangeable bases (Ca2++Mg2++K+); H++Al3+ = potential acidity, Ca acetate 0.5 mol/L, pH 7.0; Al3+ = exchangeable aluminium, Ca acetate 0.5 mol/L, pH 7.0; CEC = cation exchangeable capacity [SB + (H++Al3+); V = percentage of saturation by exchangeable bases [V = (SB/CTC)100]; N = nitrogen; OC= organic carbon, Walkley-Black method; MOS = organic matter of the soil, Walkley-Black method; EC = electrical conductivity of the aqueous extract (1:2.5). Prior to treatment, the experimental area was limed with 3.3 t ha-1 of calcitic lime (47% CaO, 2% MgO and 81% of PRNT), applied on the entire surface and incorporated at a depth of 0-20 cm to increase the soil’s saturation percentage using exchangeable bases from 39.7 to 80.0% (Cavalcanti, 2008). Sixty days after liming, pits were opened (40 × 40 × 40 cm) with a distance of 4 m between plants and lines, followed by seedling transplantation. Fertilization processes were performed as suggested by Silva et al. (2014a). Phosphorus (P) was divided into three applications of 40 g plant-1 of P2O5. The first was performed after pit preparation, the second was made 30 days after transplantation (DAT) and the third was performed 270 DAT using simple superphosphate (18% of P2O5, 16% of Ca, 12% of S). Nitrogen (N) was divided into three doses of 30 g plant-1 at 30, 270 and 330 DAT (08/2012; 04/2013 and 06/2013), deriving from ammonium sulfate (20% N). All seedlings were derived from seeds and were transplanted to the field at 90 DAT, with an average of four pairs of completely expanded leaves. Treatments were distributed according to a 5 × 2 factorial design in randomized blocks with four replicates and three plants per plot. The factors were five doses of potassium chloride (0; 13.2; 37.5; 61.5; and 69.6 g plant-1) to increase K levels in the soil from 20 to 45; 90; 135 and 150 mg dm-3 in the soil with and without application of 12 kg of cattle manure, at a carbon-to-nitrogen ratio (C/N) of 18:1 to increase the organic matter index from 1.69% (initial rate) to 4.00%, taking into account the soil volume of the pit. Before its application, samples of cattle manure were collected and chemically analysed for fertility (Table 2), as suggested by Donagema et al. (2011). Table 2: Chemical characterization of the cattle manure used in the experiment. pH = hydrogen ionic potential; C = carbon, oxidated by potassium dichromate and determined by colorimetry; N = nitrogen, N-Kjeldahl by wet digestion; P = phosphorus, Mehlich 1 and photocolorimeter reading, 660 nm; S = sulphur, spectrophotometry with wavelength readings of 420 nm; K+ = potassium and Na2+ = sodium, determined by flame photometer; Ca2+ = calcium and Mg2+ magnesium, determined by atomic absorption spectrophotometer at wavelengths of 422.7 and 285.2 nm, respectively; C:N = carbon/nitrogen ratio; B = boron and Fe = iron, determined by UV-VIS spectrophotometer at wavelengths of 460 and 508 nm, respectively; Cu = copper, determined by atomic absorption spectrophotometer at a wavelength of 324.7 nm;; Mn = manganese and Zn = zinc, determined by EAA with flame air-acetylene. Both potassium chloride and cattle manure were divided into 3 equal plots of 0; 4.4; 12.5; 20.5 and 23.2 g plant-1 of KCl and 4 kg plant-1 of cattle manure dried in shade with 5% humidity, discounting the existing water in the organic input humidity. The first fertilization with both fertilizers was performed in the foundation during pit preparation (07/01/2012), while the second and third fertilizations were performed in the hedge at 30 DAT (08/01/2012) and 270 DAT (03/01/2013). leaf samples were collected from the third and fourth pairs of leaves at 510 DAT (11/2013), which corresponded to the period when the plants were in full bloom, as described by Kumar and Ponnuswami (2014) and Silva et al. (2014a) for noni plants cultivated in India and Brazil, respectively. Counting from the top to bottom of the branches located in the median part of the plants and in each quadrant of the treetop, 12 leaves were collected (Malavolta et al., 1997). This is the methodology adopted for foliar sample collection from coffee trees. Samples were dried in an air-circulating oven at 65 °C for 72 h, then milled and placed in paper bags appropriately identified with the treatment, date of collection, species, organ and researcher responsible for the material. Samples were then sent to the laboratory for determination of macro (N, P, K, Ca, Mg, S) and micronutrient (B, Fe, Mn and Zn) levels by means of the methods proposed by Bataglia et al. (1983). Fruit harvest was conducted on a weekly basis from 330 to 510 DAT, when the fruits showed the same colour as the whitened bark, which is considered the picking point for noni fruit (Silva et al., 2014b). All fruits were counted to calculate the number of fruits (NF) harvested per plant, and fruits were weighed with a semi-analytical (model L3102 Mettler-Toledo Ind. and Com. Ltda., Barueri, São Paulo State, Brazil) weighting scale to calculate production per plant (PP). Data were obtained in four replicates and submitted to a variance analysis by the F test (p<0.05 and p<0.01). The mean values in reference to variation factor cattle manure were compared by the F test at 5% and 1% probability ± standard variation (SD), which is conclusive for two values of the same factor, while the values referring to the doses of potassium chloride were compared by regression analysis with the software SISVAR 5.6 (Ferreira, 2014). The interaction between potassium and cattle manure had a significant effect on the foliar contents of nitrogen, sulphur (S), manganese (Mn) and zinc (Zn) (Table 3). Phosphorus and potassium rates responded to the isolated effects of KCl and cattle manure, but foliar levels of calcium (Ca), magnesium (Mg), boron (B) and iron (Fe) were not different facing any variation source, as well as its interaction. 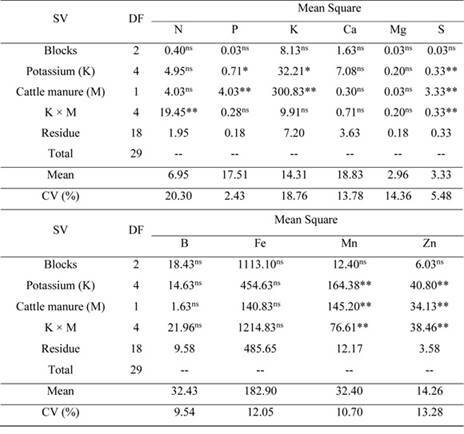 Table 3: Summary of variance analysis based on the mean square for foliar contents of macronutrients (N, P, K, Ca, Mg and S) and micronutrients (B, Fe, Mn and Zn) in noni plants fertilized with potassium chloride and cattle manure. Regarding the treatments without cattle manure, doses up to 32.2 g of KCl stimulated an increase of N content in noni leaves, reaching a maximum estimated value of 25.62 g kg-1, while other doses decreased the N content of plants (Figure 2A). The foliar contents of N in noni plants raised with cattle manure did not correspond to increased KCl in any of the regression models, exhibiting a mean value of 19.20 g kg-1. Foliar P contents increased from 1.97 to 2.87 g kg-1 between plants grown in soil without and with the maximum estimated KCl dose of 35.7 g plant-1, providing an increase of 45.68% (Figure 2B). The foliar P contents were increased from 2.05 to 2.73 g kg-1 between plants raised in soil without and with cattle manure (Figure 2C). Figure 2 Leaf nitrogen (A) and sulphur (F) for noni leaves grown in soil without (- - -) and with (-) the corresponding doses of potassium chloride; leaf phosphorus (B) and potassium (D) in noni leaves of plants grown in soil with doses of potassium chloride; leaf phosphorus (C) and potassium (E) in noni leaves of plants raised in soil without ( ) and with ( ) cattle manure. The foliar contents of K were linearly increased at a rate of 0.0713 g kg-1 by the unitary increase of potassic fertilization applied to the soil (Figure 2D) in amounts ranging from 16.18 to 21.15 g kg-1. This increase yielded a difference of 30.7% between treatments with and without the dose of 69.6 g plant-1 of KCl. Similar to the results for P, the foliar content of K increased from 16.65 to 21.61 g kg-1 with the application of cattle manure, representing a difference of 29.8% between plants in soil without and with this input (Figure 2E). Levels of Ca2+ and Mg2+ in leaf dry matter did not exhibit treatment effects; however, their average values were 18.83 and 2.96 g kg-1, respectively. In both situations, noni plants were nutritionally balanced in sulphur compared to coffee tree demands (Malavolta et al., 1997). The foliar contents of S did not vary according to KCl dose in the soil without cattle manure; the average value of S was 2.97 g kg-1 (Figure 2). At the same condition of potassic fertilization, S levels for plants fertilized with an organic fertilizer increased to a maximum value of 3.76 g kg-1 with the maximum estimated KCl dose of 41.4 g plant-1. Boron and iron leaf levels were not influenced by any of the experimental manipulations, with average values of 32.43 and 182.90 mg kg-1 (Table 3), respectively. These nutrients show that noni plants, when compared to coffee trees during the sampled period, were deficient in B, but adequately supplied with Fe (Farnezi et al., 2009). The foliar content of manganese in plants raised without cattle manure was elevated by an estimated KCl dose of 52 g plant-1, reaching a maximum value of 35.45 mg kg-1 (Figure 3A). Similarly, KCl doses of up to 35.5 g plant-1 in soil containing cattle manure increased the foliar content of Mn to a maximum of 43.1 mg kg-1 (Figure 3B). By comparing the highest foliar contents of Mn for treatments without and with manure, we found that organic input increased the foliar manganese content of noni plants by 21.6 percent. The foliar contents of zinc in treatments without cattle manure linearly increased by 0.0481 mg kg-1 with unitary increments of KCl dose (Figure 3C). Values rose from 11.4 to 14.7 mg kg-1 between plants in soil without and with the highest KCl dose, thus indicating a 29% increase under the same conditions. Such KCl increases in the treatment without manure stimulated the foliar contents of Zn to the highest dose of 34.8 g plant-1 of the mineral fertilizer, enabling a Zn value of 21.3 mg kg-1; this difference represented a 92.06% gain relative to plants raised in soil without KCl. Figure 3: Leaf manganese and zinc in noni plants as a function of different doses of potassium chloride in soil without (- - -) and with (-) cattle manure. The number of fruits and plants produced did not vary according to theinteraction of potassium doses with cattle manure; however, it was influenced both by mineral and organic fertilization (Table 4). Table 4 Summary of variance analysis, based on the mean square for fruit number and production by noni plants as a function of potassium chloride and cattle manure content in soil. The addition of cattle manure and potassium stimulated increases in fruits per plant relative to soil without the respective fertilizers (Figure 4). The number of fruits harvested from plants fertilized with manure increased from 51 to 70 fruits plant-1, representing an increase of 19 fruits plant-1 or 37% relative to treatments without manure (Figure 4A). Increasing doses of KCl have linearly raised the number of noni fruits from 53 to 65 fruits plant-1, representing a 22.6% increment between plants in soil without and with the highest applied dose (69.6 g plant-1) of potassium chloride (Figure 4B). As observed for the number of fruits, cattle manure and potassium chloride enhanced plant production. The range of 5.11 to 7.99 kg plant-1 represents an increase of 56.4% in plant mass compared to plants grown in soil without cattle manure (Figure 4C). 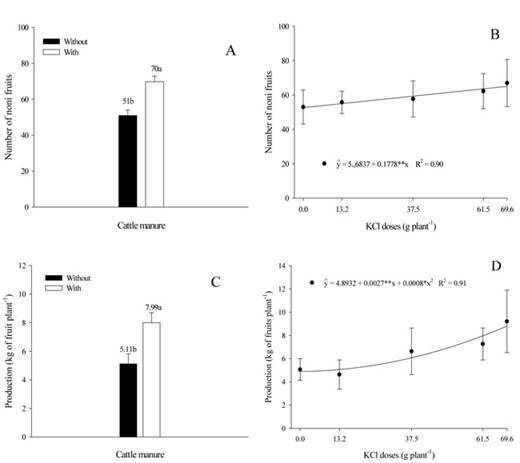 Moreover, potassium chloride stimulated fruit production relative to plants grown in soil without the mineral input, with values of 4.89 and 8.95 kg plant-1, representing an increase of 83% between treatments without and with the highest dose of KCl (Figure 4D). Figure 4: Number of noni fruits and production for plants raised in soil without and with cattle manure (A) and doses of potassium chloride (B). The statistical results for calcium and magnesium data (Table 3) are in accordance with Silva et al. (2014a), as they concluded that both the interaction between potassium and cattle manure and the treatment effects had significant effects on content of the respective macronutrients in noni leaves at 33 months of age and nine months after the treatment application. The aforementioned authors observed that only the foliar contents of K, B, Fe, Mn and Zn in noni plants were influenced by the interaction between potassium fertilization and cattle manure. The results for leaf nitrogen (Figure 2A) indicate that only plants fertilized with KCl had adequate content, which varied from 22.5 to 27.9 g kg-1 in the Brazilian coffee cultures (Farnezi et al., 2009). A foliar N content of 25.62 g kg-1 in plants treated with 32.2 g plant-1 of KCl was observed, which exceeded the value of 19.14 g kg-1 as reported by Kumar and Ponnuswami (2014) for the same culture and phenological period (blooming and fructification) fertilized with cattle manure under irrigation in India. However, the results do not exceed the value 35 g kg-1 of foliar N reported by Silva et al. (2014a) in plants of the same culture, fertilized with cattle manure. Such increases are due to the use of organic matter (cattle manure), which accelerates the mineralization rate of P in soil, thus contributing to the production of organic acids that occupy the phosphate adsorption site in the soil, increasing phosphate availability to plants (Pavinato and Rosolem, 2008; Thangarajan et al., 2013). Similar results were obtained by Kumar and Ponnuswami (2014) and Silva et al. (2014a), who noted that the application of cattle manure increased P content by 47.7% and 28.0% in India and Brazil, respectively. Increased KCl in the soil stimulates both the absorption and transfer of K from plants to leaves (Figure 4B) and, according to Ranade-Malvi (2011) and Marschner (2012), contributes to increased metabolic activity of N, given that protein synthesis is also dependent on adequate potassic nutrition. Under such conditions, elevated K content in leaves activates nitrate reductase (an enzyme that catalyses proteins) in foliar tissues. Similar behaviour was observed by Anjos et al. (2015) in papaya cv. “Tainung nº 1” (Carica papaya L.) and by Ferreira Neto et al. (2014) in coconut trees (Cocos nucifera) cultivated in Brazil. 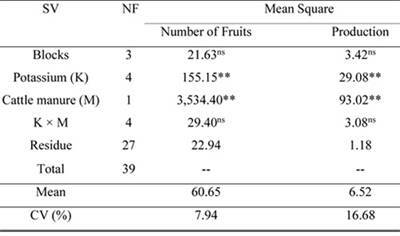 These researchers verified that increasing doses of a potassic fertilizer stimulated the increase of N foliar content in the respective fruit trees. Such increases result from the fact that the fertilizer is a source of potassium, and the growing data are consistent with increased potassic fertilization in banana - Musa ssp cv. “Pacovan Apodi” (Barroso et al., 2011), guava - Psidium guajava cv. “Paluma” (Amorim et al., 2015), papaya cv. “Tainung nº 1” (Anjos et al., 2015) and sugarcane - Saccharum robustum (Almeida et al., 2015), all cultivated in Brazil. Cattle manure is an excellent nutrient source (Table 2), and after its mineralization, this nutrient is released into the soil, thus incrementing its absorption by plants and elevating its contents in leaves. Organic fertilizers release nutrients in a balanced and gradual way, thus contributing to nutrient losses reduction, especially by lixiviation, and enhancing soil fertility, as in the case of potassium (Quilty and Cattle, 2011; Kumar and Ponnuswami, 2014). The lowest level of potassium, which ranged from 16.18 to 21.61 g kg-1 exceeded the value of 12 g kg-1 observed by Singh and Rai (2007) in the foliar tissue of noni plants cultivated in India, as well as the range between 13.6 and 14.6 g kg-1 observed by Silva et al. (2014a) in noni plants cultivated in Brazil. These results verify the importance of potassic fertilization for noni mineral nutrition, given that potassium is the second most abundant element in leaves and the most present in fruits (Cavalcante et al., 2014). Considering that noni’s demands for calcium and magnesium are similar to those of coffee trees, plants were adequately supplied both in calcium and in magnesium (Farnezi et al., 2009). Increases in the foliar contents of S in plants fertilized with cattle manure are explained by the organic input, which is a source of this element (Table 2), as well as by the 12% of S originating from the simple superphosphate; it is seen that when both are applied simultaneously, sulphur availability in plants increases (Higashikawa et al, 2010). Regardless of the benefits provided by cattle manure compared to treatments with only the simple superphosphate, the foliar contents of S were below the level of 8.9 g kg-1, as observed by Silva et al. (2014a) in plants of the same species fertilized with cattle manure and potassium, indicating that noni is a demanding culture with respect to sulphur. The increase of leaf manganese is in accordance with the report of Ranade-Malvi (2011), who reported a synergistic effect between K and Mn, in which the nutrient’s increase contributed to a greater absorption of K. Our results are also in accordance with Amorim et al. (2015), who observed a linear increase in foliar Mn content in guava plants that received potassic fertilization from 0.0 to 2.2 kg plant-1 for three consecutive cycles. Despite the increase of Mn content with the application of organomineral fertilization, these values are below the ranges of 1.576 to 2.329 mg kg-1 (Silva et al., 2014a) and 1.075 to 1.888 mg kg-1 (Teixeira et al., 2016) obtained in the same culture and below the range of 80 to 100 mg kg-1, which is considered sufficient for coffee cultivation (Malavolta et al., 1997). Results for leaf zinc were similar to those observed by Moinuddin and Imas (2010) by applying K2O doses from 0 to 60 kg ha-1 and supported a linear increase in Zn leaf content in sorghum plants (Sorghum bicolor). The results of Rodrigues et al. (2009) for yellow passion fruit plants cultivated in Brazil and treated with different doses of bovine biofertilizer in soil containing KCl were similar to the current results for noni plants fertilized with doses of potassium and cattle manure. Comparatively, the foliar content of Zn was below the range of 99.0 to 111.7 mg kg-1 obtained by Silva et al. (2014a) and 140.4 to 200.9 mg kg-1 by Teixeira et al. (2016) for noni plants cultivated in Brazil. In contrast to coffee trees, Malavolta et al. (1997) suggested that adequate levels of Zn were between 15 to 20 mg kg-1. This finding indicates that noni plants differ from coffee trees in their nutritional demands and highlights the importance of defining adequate levels in this culture. Similar results to those reported in Table 4 were obtained by Souto et al. (2016), who also observed an absence of significant effects for the interaction of noni fruit mass and length. A similar tendency to that illustrated in Figure 4A was verified by Pacheco et al. (2017) for passion fruit plants in Brazil: this study observed that the application of cattle manure in soil increased the number of fruits per plant, exceeding the yield of plants treated with only mineral fertilizers. Similar results to those reported in Figure 4B were presented by Anjos et al. (2015) who observed that by applying KCl in the soil, the number of fruits per plant was elevated. Such increases reflect a response to K availability to plants due to fertilization with KCl, as indicated by the foliar contents (Figure 4B). According to Wang and Wu (2013), potassium participates in metabolic reactions as a protein and enzyme activator; and in stomatal conductance with roles in carbohydrate transport, respiration and photosynthetic rates in plants, thus positively affecting production of crops such as noni. The yield of fruits per plant, regardless of cattle manure or potassium content in the soil (Figure 4C and 4D), is associated both with an increased number of fruits harvested (Figure 4A and 4B) and greater average mass of fruits, as observed by Souto et al. (2016) for plants of the same species given different treatments. Noni plants respond to fertilization with cattle manure and KCl, reflecting increases in the number of fruits and in production per plant. Compared to coffee trees, noni plants were adequately supplied with N, P, K, Ca, Mg, S, Fe and Zn and deficient in B and Mn. The application of cattle manure improves the foliar contents of P and K, positively affecting on the formation and production of fruits in noni plants.